George Eastman House and International Museum of Photography and Film in Rochester, New York. Nikon D700/28-300VR, 1/60s, f/11, ISO 4000, EV 0, 45mm focal length. The 35,000-square-foot Colonial Revival house of George Eastman took three years to build and was completed in 1905 at a cost of $300,000. The estate originally included a stable, garage, barn, five greenhouses, and many vegetable and flower gardens on eight and one-half acres. The house has thirty-seven rooms, thirteen baths, and nine fireplaces. Today the house is home to the International Museum of Photography and Film which resides behind the original home which is kept as a memorial to the man who created modern photography through his company, Kodak. Conservatory room of the George Eastman House in Rochester, New York (see text for more information). Nikon D700/Tokina 11-16mm, f/8, ISO 2800, EV 0, 16mm focal length, HDR. I have visited other homes and museums of millionaires from the 19th and 20th century before. 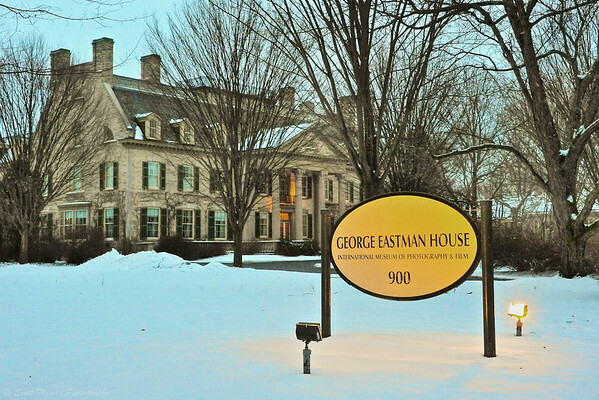 Unlike the others, George Eastman never married so his home was more like a bachelor pad. As an avid big game hunter, he used lots of animal trophies, furs and even feet of antelopes and elephants for ashtrays and trash cans in his house. His library features a desk topped with a rhinoceros hide. In 1928, on George Eastman’s second African safari, he returned with an elephant trophy. Research has showed that Eastman’s taxidermists were so impressed with the animal’s great size they made a mold of it to cast a copy for their showroom. In 1989 the mold was used again to create the fiberglass replica now on display in the conservatory during a $1.7 million dollar restoration of the house. The elephant George Eastman had taken only had one tusk and was described as “rogue”. He had the tusk removed, mounted separately and displayed on the floor below the trophy. Two wooden tusks were made for the mounted head as replacements. The original ivory tusk has long since disappeared and another is on display (seen in the photo above). George Eastman also supported financially the first wildlife film photographers in Africa which brought back the wonders of the continent which was full of mysteries to Western civilization in the late 19th and early 20th centuries. 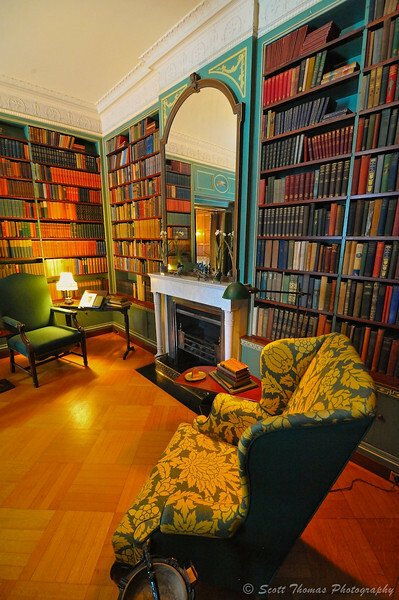 The Library in the George Eastman House in Rochester, New York. Nikon D700/Tokina 11-16mm, 1/8s, f/8, ISO 6400, EV +0.3, 16mm focal length. Floor to ceiling book shelves are found on every wall in Eastman’s library except where the window and fireplace are. This is one of the smaller rooms in the house and George had more shelves built in the living room to be able to hold his entire collection of books. 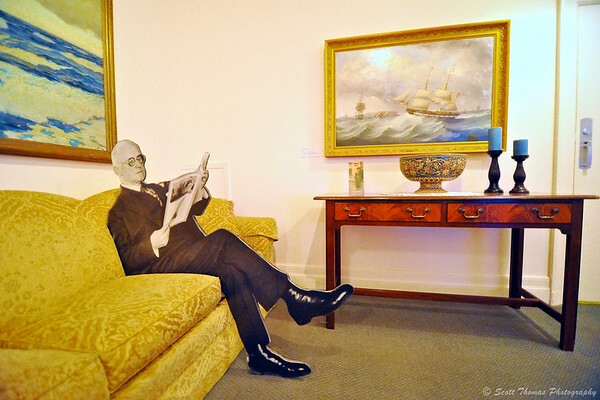 A photo cutout of George Eastman sits in the Reading Room of the his house in Rochester, New York. Nikon D700/Tokina 11-16mm, 1/60s, f/2.8, ISO 5600, EV 0, 15mm focal length. I planned my visit to the George Eastman House a few weeks ago so it was a coincidence a couple of days before I took these photos Kodak, the company George Eastman founded back in 1888, declared bankruptcy. It is my hope, Kodak can emerge from it and again take its place as one of the most innovative technology companies in the world as it had become when George was at the helm. This entry was posted in Travel, Weekly View and tagged 28-300mm, address, african elephant, conservatory, george eastman, history, house, kodak, library, new york, nikon D700, rochester, sign, snow, tokina 11-16mm, vr, winter. Bookmark the permalink. I just love your forays into history. The conservatory shot is practically three-dimensional. It makes me want to climb into the monitor and walk around in the room. It’s extraordinary how many iconic industries were founded in the late nineteenth century–and how much they’ve changed. Sears, Kellogg, Kodak. The entire iron and steel sector. It’s good to reflect on these things. I, too, hope Kodak can recover. Fine post, Scott. Thank you, Gerry. I, too, wished I could have explored that room more. It was roped off. Maybe some day I’ll attended a function there where they open up the rooms. A few people have told me they have done so. Kodak should have been at the forefront of the digital photography age. They own a lot of patents they could have used in their own products. They were the first to work with Nikon on digital SLR technology. However, now Nikon uses SONY sensors as Kodak went in a different direction trying not to step on their film sales. They should have released that was a lost cause and moved more aggressively into creating sensors and other digital products. Their photo printers were and are very good but they did not innovate them enough that consumers would buy them like they do Canon, Epson and HP models. 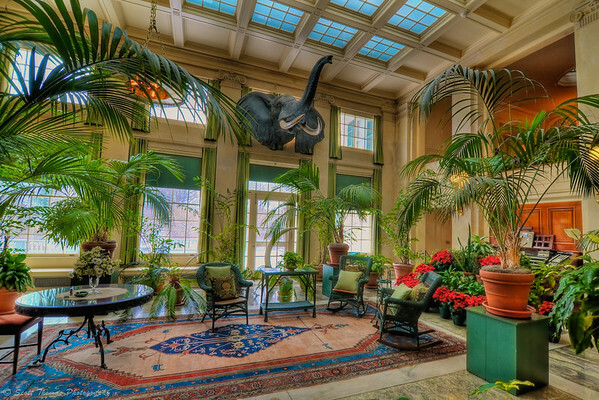 Awesome HDR on the Conservatory room…..Love it. Scott, the Conservatory room shot is gorgeous, love the library shot also. It was so sad to hear about Kodak, I hope they will pull out from this. Wow, that is some house! Nicely shot, Scott! I love the George Eastman House. The spring flowers will be out in the conservatory in a couple of weeks! Great house he had, this George Eastman. I’ve also read about Kodak’s bankruptcy – and strangely enough, wasn’t it Kodak, that invented the successful digital camera? !